There are those who function within the status quo, those who challenge it, and those who transcend it altogether. Amy Goodman is in the final category. In this era of corporate-controlled news and spin, Goodman is an anomaly: a true journalist and storyteller, committed to bringing her audience the truth. 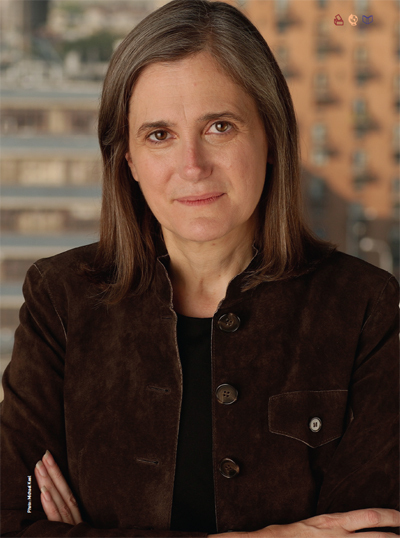 As a woman who is not simply outside the system but beyond it, Amy Goodman exemplifies the woman of the future. Rather than participate in mainstream American media, which is controlled by six major corporations and deeply beholden to both corporate interests and politicians, she created her own venue, on her own terms. Today her independent radio and television show Democracy Now! airs on more than 500 stations and is the spearhead of the largest public media collaboration in American history. Goodman is a fierce and tireless advocate for the voices we don’t hear, the stories we don’t know, the people we can’t see. Her journalism is personal; we hear first hand from the wife of the Al-Jazeera camerman killed by the U.S. military, the sister of the Georgia man wrongly awaiting execution, the mother of the young woman courtmartialed after going A.W.O.L. from the U.S. army when her commanding officers sexually harassed and abused her. She takes the immense power that media has and uses it to humanize all of us, to connect us with one another. At the same time, wherever an abuse of power is occurring, she’s there, before the mainstream media and often in their place. Many stories that have broken nationally began at Democracy Now! and never would have surfaced without Goodman’s dogged pursuit of the story. After nearly being killed in a massacre by U.S. backed Indonesian troops in East Timor, she brought the story home. Later, she risked her life to report the story of Chevron’s role in the murder of Nigerian villagers. Despite some of the truly horrendous stories she covers, she maintains a calm, even tone, moving easily between chilling facts, personal stories from relatives of those lost in Iraq or confined at Guantanamo Bay, and anecdotes. While so many news anchors are making themselves the story, she excels at getting out of the way. SuperConsciousness Editor-In-Chief Heidi Smith spoke with Amy Goodman about how she sees her job, what inspires her, and her vision for the future of media. SC: You are a successful woman journalist who is outside of mainstream media. Obviously there are successful women journalists within the mainstream. How is your experience different? AG: Well, like many people in independent media, I have a very different philosophy than most people who do journalism in corporate media. It’s about being unembedded. It’s about challenging power. These are the basic principles of good journalism. Not just challenging the whole embedding process, which has brought the media to an all time low, but not [being] embedded in the corporate establishment, where it’s hard to separate the reporters from the people that they cover. SC: What you are referring to as the access of evil? AG: Right, not enjoying the access of evil, which is trading truth for access; that in order to get that quote from the vice president, or the president, or the secretary of defense, you compromise the tough questions that a reporter has to ask in a time of war. We are not there to cheerlead for war, for the president, we are there to get at the truth. We’re trying to do something very different and that is journalism that serves a democratic society, that brings out the voices of people who are not usually heard yet represent most people in this country. SC: Does being a woman affect the stories that you cover and how you cover them and if so, how? AG: I think being a woman makes me particularly sensitive to people who aren’t heard, and [creates] a commitment to providing a forum for those voices. SC: You bring a large human element into your stories. What stories have you covered that have gotten the biggest response and what role did the human element play in those stories? Just hearing someone describe what they are going through personally, it’s not a theory it’s not an idea, it’s very clear cut. Hearing it from the people closest to the story, that’s what I try to do everyday. AG: I think we are storytellers. And that is the greatest power that we have, in addition to just giving the microphone to people most importantly to tell their own stories. Telling the story of Troy Davis, the man on death row, and speaking to his sister [Martina Correia] who has been fighting for him for oh, more than fifteen years and she herself dying of cancer, and yet she will not give up on her brother. As she was going into the courtroom and to the parole board hearing, she stopped to talk to us and it . . .just hearing someone describe what they are going through personally, it’s not a theory it’s not an idea, it’s very clear cut. Hearing it from the people closest to the story, that’s what I try to do everyday. SC: So you are bringing it home to people. AG: People understanding their stories, who are their sisters and their brothers. How they feel about what is happening to them. In the same way you take a global issue like war. It is critical to show the images of babies dead on the ground, of women with their legs blown off because this is the real fact of war, this is what people experience each day and it’s not theoretical at all. SC: You’ve talked about the difference between CNN and CNN International in that regard in terms of the images that we see in this country. AG: Right, I mean just taking that example, it’s one company that has two networks, and when it comes to war they are broadcasting different images even though they have access to the same pool of images. They know internationally that they cannot get away without showing those images of war. Here at home, its sanitized… in the Wall Street Journal, they did a piece right at the beginning of the invasion, the day the statue of Saddam Hussein was pulled down by U.S. Marines in Fardus Square. Domestically the reason this has become the most famous image of the invasion [is] not just CNN, all the networks showed that image thousands of times, but CNN International news, they couldn’t get away with just showing that, so they showed a split screen with the casualties of war. That is what war is. That is suffering and until we show that, then war is still an option and when we show it, I really do think people would say no to war in the 21st century. SC: How do you manage to maintain your equanimity in the face of some of the things that you are covering? AG: I think it is because people work so hard to change things, and that is what inspires me. . . people organizing all over around so many different issues do not give up hope. When I covered the occupation of East Timor by the Indonesian military armed by the United States government, it was the people of Timor who were hopeful. Unbelievably enough, a third of their population was wiped out. Yet they looked forward to a time when the occupation would end. 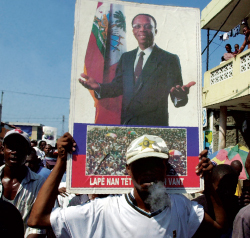 In Haiti, in a time when they have been suffering for two hundred years, here you have the oldest black republic in the world, the president, democratically elected president Aristide is pushed out twice, forced out in a U.S.- led coup. 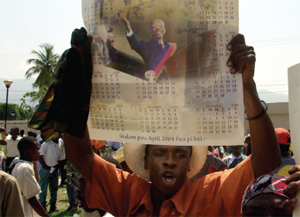 If the people of Haiti are politically engaged, are hopeful, people organize. I’m continually inspired in this country. Here we come from the most powerful country on earth and the effect of that power now is such terrible abuse of people around the world and people are doing something about it. Even with the media shielding people here, not showing them the effect of the U.S. government policy, people are getting information, are hungry for alternative media that will get at the truth and people are organizing in their own community at just a local level, so I’m continually inspired by that. Even with the media shielding people here, not showing them the effect of the U.S. government policy, people are getting information, are hungry for alternative media that will get at the truth. SC: How has [being outside mainstream media] impacted you in terms of you access? AG: I have always felt strongly that it’s absolutely critical to get information out and I think it also has to do with an earlier question you asked about being a woman and does it make a difference to be a woman reporter. I think it has to do with growing up in a relationship with the world, not trying to conquer it, but understanding people in relation to each other, and I learned this from my mother and my father. My father was an unusual man. He listened deeply, he was a doctor . . .when he would come home at the end of the day, what he was most interested in talking to us about was the lives of his patients, what people were doing, how they were growing up, their families – because he deeply cared, that was what motivated him. My mother taught women’s history and literature at local community colleges before she became a social worker. She was doing continuing education. Cops, firefighters, truck drivers would come in to get more credits, and more credits would mean a higher salary, so they figured they’d take an easy course and that would help them out – like Chick Lit: ok we’ll read some women’s book or we won’t read them, and here she was – Virginia Woolf, Toni Morrison. The two of them made such a difference in my life, and my brothers’ lives in embracing the world. They were very committed to our community . . .committed to family but seeing family also larger than the nuclear family – that you had to make a difference in the world. That’s how we were raised. She just was always learning, always reading, always writing. She was the secretary of two women’s organizations, known for all of her cards whether they were a happy birthday, or a condolence card. She sent out hundreds of letters a week. It was about creating community, and when we see that community challenged its absolutely essential to get to the bottom of it. SC: You said that from an early age you found it important to hold people accountable and was that a result of your parents? AG: It was our whole extended family. I was also very influenced by my brothers, like the brother David who I write books with, Exception to the Rulers and Static. I can’t remember how old he was eight, or nine, or ten. He ran Dave’s Press, so there were signs in our house, all throughout pointing upstairs to his room, “Dave’s Press” and he had this Xerox machine, the old kind where you had to press down and it would burn the image. At first it was a sort of glorified family calendar, and it went out to the extended family. It would say, “On Wednesday, Mom spanked Amy”. Then my mother put her foot down and said, “no dirty laundry in this newspaper” and then David cried censorship. AG: He really cried, because he was like 8 years old, but it went to bigger issues as well. Of course there was a letters to the editors page, and David would take stands on the Vietnam War. My grandfather would write in and say “I love you so much, but I disagree on this point” and then David would write back, “Grandpa thank you so much for being the first subscriber, but you’re an idiot on the war”, and then my great uncle would write in and say, “how could you say that to your grandson?” And I was the one who made sure that – we would put the little notes under my brothers’ and my parents’ door ‘you owe one cent’ if they hadn’t paid up for their subscription. My dad was the head of a task force that integrated the schools of our community. I think I was in about 5th grade or 6th grade and I would go with him to the cafeterias the auditoriums of our schools. Thousands of people would turn out screaming and yelling, and I watched as he judiciously guided our community to a more racially just place despite the adversity, despite all of the pressure. There were death threats and yet …I just so admired seeing that firm, unwavering, just person. Our extracurricular activity as we grew up was always the newspaper, and high school really made a big difference. At that time I always saw [journalism] as holding those in power accountable and at that time I saw it as holding the principal accountable. Then as we went on to larger spheres, holding those who had wielded even greater power in the world accountable, and that is where I am today. SC: What’s your take on how journalism is taught in universities? AG: I didn’t go to journalism school, though I’ve taught journalism students at Columbia for many years. Whenever I was doing the news at WBAI, when I was training the students or working with reporters, whenever they came back I would say, tell me about what you went to: what do you remember? No, don’t check your notes, just tell me what stands out for you. Trust yourself, and that’s going to be the most important quote to pull, is what affected you the most, what stood out, not going back over it. What matters to you is what you should go with and then in your writing you write around that and you bring in the facts around it. It has to be something that people identify with and that’s where journalism has fallen so far short. For example when it comes to war, if we can’t identify with people at the target end of the gun, if we don’t know their names, if we don’t know their mothers, their fathers, their brothers, the village they came from the community, the school they went to, its harder to identify and much easier to remove ourselves. The Virginia Tech shooting, the media does the right thing in going to that place, telling us about the victims, the students, the professors who were killed, who were they, what were their aspirations, what had they accomplished, who were their parents, give voice all of this. It was such a terrible tragedy. That was the right thing, and the whole country mourned. 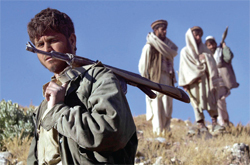 When it comes to war, if we can’t identify with people at the target end of the gun, if we don’t know their names, if we don’t know their mothers, their fathers, their brothers, the village they came from the community, the school they went to, it’s harder to identify and much easier to remove ourselves. We need to do the same thing when it comes to Iraq. Just three months before at Mustansiriya University in Bahgdad there were two explosions, car bombs, suicide bombing, seventy, mainly young women, were killed. We need to know their stories, their names. What were their aspirations? In fact, the same day as the Virginia Tech shooting, two more professors were killed in Iraq. If we knew these stories before I don’t think people in this country who decide whether the trigger is pulled would stand for war. It doesn’t matter the position of power you occupy in society. In fact it’s very important that we go to the grassroots, that we dig deep for those who are not usually heard. That’s the role of journalists. That’s the reason our profession is the only one explicitly protected in the U.S. Constitution. SC: This administration appears to be targeting journalists, particularly in Iraq, and you pointed out that more journalists have died in Iraq than did in Vietnam already. What impact does that have on you as a journalist? AG: Killing the messenger, shooting the messenger is a great danger to us all. That goes beyond journalists as well. There are so many journalists who have died in Iraq in the last few weeks. We’re talking about Reuters, we’re talking about journalists, not only being killed by the way, but also being detained. You have Bilal Hussein, who is an AP Pulitzer Prize winner held by the U.S. military for more than a year. You have Sami Al-Haj, who has been held in Guantanamo for more than 5 years. 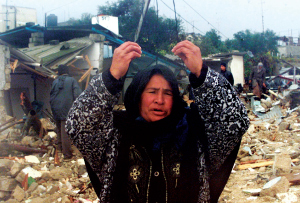 The shelling of the Palestine Hotel on April 8th, 2003 by the U.S. military where it was known around the world this was a place where hundreds of unembedded journalists were staying and the killing of Taras Protsyuk…again who was a cameraman for Reuters. 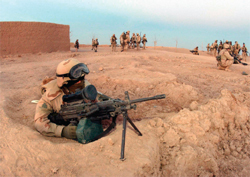 Jose Couso, the journalist from Telecinco, the cameraman from Spain – his brother and mother have never stopped in trying to bring those responsible to justice, suing the U.S. and the military, the soldiers who were involved. A few hours earlier at the Al Jazeera offices a young reporter [Tareq Ayyoub] had just come over from Jordan, on the roof fixing the camera lens, the camera on top of the Al-Jazeera offices, and he was shelled by U.S. military and killed. His wife, Dima Tahboub, at the funeral saying ‘the U.S. says it’s fighting terrorism. Who’s engaged in terrorism now?’ It keeps on happening, mostly now with Arab journalists. They are the ones who are hardest hit. It is so frightening.